What I ordered showed up quickly. It arrived ahead of schedule. 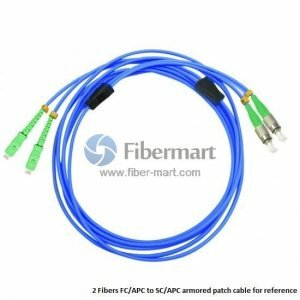 Multi-core armored cables retain all the features of standard fiber patch cables, but they are much stronger as they have small stainless steel casing and metal net. With the armor, the cables have a high compressive strength, tensile strength and anti-rats biting. Fiber-Mart supply high quality multi-core armored cables with LC, ST, FC, SC, E2000, MPO, MTP connectors, etc., and they can be widely used in national defense and Temperature Sensing Systems. We also can customize cables to meet your requirement; any color and any length are available.